At least four documents show that Michael Siegel (father of Jerry Siegel, co-creator of Superman) died not from gunfire as stated in Men of Tomorrow and elsewhere but from a heart attack during a robbery of his clothing store in 1932. Earlier, I posted one of those documents, the coroner's report. 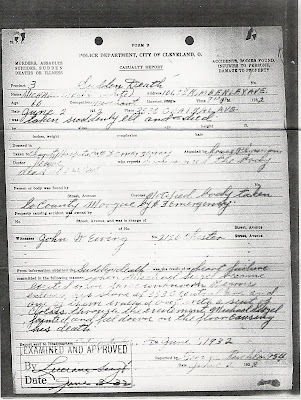 Here is the first page of the second, the police report. I am not posting the second and third pages—to see those (as well as the third document, the death certificate), you will have to wait until my friend Brad Ricca's book comes out. As for why I am doing it this way, see below. "when Michael Siegel became excited when three unknown Negroes entered his store at 3530 Central Ave and one of them walked out with a suit of clothes. through the excitement Michael Siegel fainted and fell down on the floor causing his death"
Page 2 is titled Criminal Complaint. Page 3 is Departmental Information. They both have some great details so check Brad's blog for announcements. Meanwhile, when I requested the coroner's report, which set me back 20 cents, I was told that the police report was attached to the coroner's report, but the coroner's office was allowed to send me only the coroner's report. I asked Brad if he could ask his police contact to authorize the coroner to send him the police report—and it worked. Teamwork triumphed, problem solved, report received. The twenty cents still gets me. In fact, I think I still owe them myself (oops). But Marc was definitely the one to find these documents even existed -- and it was not that they were just in a file or something, it really was an incredible stroke of luck (any such thing?) that they were even around in the first place. I had given up on them some time ago. Looks like one line is "(?) the EXCITEMENT Michael Siegel fainted..."
darkmark - Think so! Will amend. Thanks.